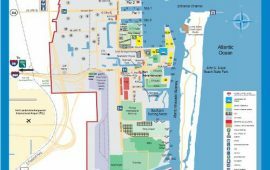 Located on the southeastern coast of the Florida peninsula within the three cities of Fort Lauderdale, Hollywood and Dania Beach, as well as unincorporated Broward County. Port Everglades is not actually part of the wetland ecosystem known as the Florida Everglades. It is one of the most diverse seaports in the United States, as well as a very busy cruise port. Cruise vacations and international trade are what makes Port Everglades the the economic powerhouse that it is in Broward County. Port Everglades is ranked second among cruise ports worldwide and has more home-ported cruise ships than any other port. Global Entry is a U.S. Customs and Border Protection (CBP) program that allows expedited clearance for pre-approved, low-risk travelers upon arrival back in the United States. Upon debarkation, signage will direct cruise guests who are Global Entry participants to the front of the line in all cruise terminals. Travelers must currently be enrolled in the Global Entry program and have gone through the approval process. All applicants undergo a rigorous background check and in-person interview before enrollment. While Global Entry’s goal is to speed travelers through the process, participants may still be selected for further examination. Port Everglades is set apart by many things. Namely, in 2015, more than 3.7 million passengers visited the port. It holds the distinction of being named “2013 Best Domestic Port” by Porthole Cruise Magazine and was selected as “World’s Top Cruise Port” in 2013 and 2010 bySeatrade Insider. During 2015-2016 cruise season, it set multiple records for the number of cruise guests passing through the port in a single day. There are 9 cruise lines, 1 ferry service and 34 cruise ships servicing the Port. Located on the southeast coast of Florida, Port Everglades is accessible by car, taxi, bus and rail. Each entrance has a security checkpoint. Cruise guests and visitors age 18 and older must provide a government-issued photo ID (such as a driver’s license or passport) and cruise documents at the security checkpoint. The Port is accessible from I-595, I-95, I-75, US 1 (Federal Highway) and Florida’s Turnpike. 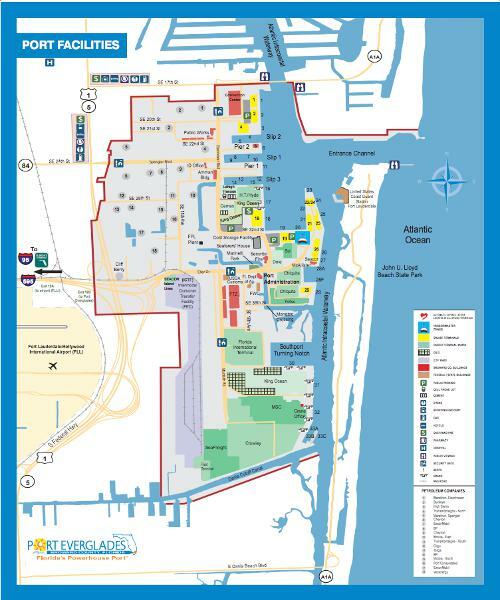 Port Everglades is the only cruise port in the U.S. located adjacent to an international airport. Miami International: 27 miles south of Port Everglades. Allow two to three hours between flight arrival and cruise check-in. Palm Beach International: 50 miles north of Port Everglades. Allow three to four hours between flight arrival and cruise check-in. Myth Buster: Port everglades is NOT in the Florida Everglades. This is a common mistake. Many people believe this, but the difference is cruise ship vs. airboat. Port Everglades, located just two miles from Fort Lauderdale/Hollywood International Airport, is cruising by SHIP. The exotic Florida Everglades, however, located about 23 miles to the west, and are a must-see by AIR.